Next up in the nuts and bolts of making your samurai live and breathe in Hachigoku are the Dharma and Discipline rules, but since this is a pretty short groundwork bit (Disciplines get their full attention in, well, 4 more full chapters!) I decided to also give you the Glory and Virtue rules. These have been cut down and streamlined and cut down and streamlined... They got the toughest, most vicious thrashing of any of the rules during playtest. So I cut and streamlined an rethought. The skeleton of its predecessor remains, but I know they are still not user-friendly enough. Only more playtesting will improve their smoothness and clarity. The three dharma common to samurai (bushi, onmyoji, and teishin) are not necessarily the only ones available to the people of Hachigoku. However, there isn't really a necessity for specifying a dharma for every non-samurai encountered, especially among Kaonashi. It's enough to know a farmer is a farmer. Every Discipline corresponds to one of the samurai Dharma; later in their career a samurai may learn a new Discipline, but only if it falls within their given Dharma. Some special abilities (such as certain Fortunes) expand a samurai's freedom of choice. Disciplines all share some common rules and formats, although they are only listed as needed. If it's a Basic Discipline, there's no need to list Fortunes, nor to list Virture if it's a Branch Discipline. Discipline Name (Discipline Type): The name of the Discipline, and its type of Discipline: Basic Discipline, Branch Discipline, or Advanced Discipline. At character creation you may only choose a Basic Discipline; see the Season Action rules for more information on learning new Disciplines. A Ronin Okuden carries the same header, with Ronin Okuden in place of Discipline Type. Overview: A general overview of the Discipline, its brief history, and possibly notable members. Element: If taken at character creation, you gain a +1 to this Element. Skills: These are the 6 Discipline Skills taught by a Basic Discipline. If this is an Advanced Discipline or Ronin Okuden, these are the required Skills and their Ranks you need to achieve before spending Season Actions to learn its first Okuden. Virtue: Your beginning Virtue for the Basic Discipline. If this is an Advanced Discipline or Ronin Okuden, this is the required Virtue you need to achieve before spending Season Actions to learn its first Okuden. Outfit: These are the items (armor, weapons, kimono, etc.) you begin play with, all of Standard Quality. Some Fortunes might upgrade or replace them. A reminder: a daisho is the collective term for a paired wakizashi and katana. Glory: If this is an Advanced Discipline, this is the required Glory you need to achieve before spending Season Actions to learn its first Okuden. Fortunes: If this is an Advanced Discipline or Ronin Okuden, these are the required Fortunes you need to achieve before spending Season Actions to learn its first Okuden. Discipline: This might seem redundant, but it's expressly for the Branch Disciplines, as you are required to have reached a certain level in a Basic Discipline before joining. Other Requirements: Some Advanced Disciplines have additional requirements, such as having survived a Battle or sworn oath. The full descriptions of Disciplines can be found in their appropriate chapters. Basic, Branch, and Advanced Bushi Disciplines are found in Chapter 5. Basic, Branch, and Advanced Onmyoji Disciplines are found in Chapter 6. Basic, Branch, and Advanced Teishin Disciplines are found in Chapter 7. Finally, all Ronin Okuden are described in Chapter 8, along with Ronin Advanced Disciplines. While other Advanced Disciplines contain elite training from organizations only available to uji samurai, Ronin Advanced Disciplines tend to be broad in popularity and narrow in scope. They are available to both uji samurai and ronin, provided they meet all other requirements. The concept of On is immensely important in Hachigoku; among those who follow Bushido it manifests as three distinct qualities: Virtue, Glory, and Honor, a variable pool of potential always at risk. Virtue is your measure of self-worth, dictated by an adherence to the ancient code of the warrior (at least, ancient among the samurai of Hachigoku). Glory is a measure of how well known and famous (or infamous) you are within the Empire. Both of these play into your status within the social hierarchies of Hachigoku, but while this may entail titles and responsibilities with very real everyday effects, your position in the Celestial Order cannot simply be ranked by a statistic. Generally, Virtue is your integrity. It is not a straitjacket. It does not determine how you behave; how you behave determines what it is. While Virtue is largely an internal concept, it is not entirely so; it also reflects how others perceive you. If it were purely an internal matter, it could quickly become irrelevant. Sure, the greatest of villains merely believe themselves misunderstood but honorable souls, but truly even the most loyal and cold-hearted assassin can only lie to himself so much before he realizes how others see his dishonorable actions. Although uji place different stigmas on different activities, there is a general agreement on a number of actions ultimately honorable or dishonorable. Thus, the effects and virtue of Virtue itself is an objective observation, even if the intricacies and nuances are vigorously debated. Virtue Ranks: While your Virtue as an abstract may be difficult to fathom, as a mechanic it's more straightforward. Your general measure of Virtue is measured as Ranks. Although most samurai will have Virtue of 1, 2, or 3, it is possible to have 0 Virtue. There is no finite limit to Virtue, but you cannot have a higher Virtue your Void + Dharma. Your sense of self-worth and its strength against corruption is limited by your experience and overall spiritual balance. Even though Virtue is open-ended, it is often easy to identify a samurai's honor by his actions and demeanor, at least in the lower Ranks. The people of Hachigoku have very definite opinions about the character of varying Virtue Ranks, even when they don't adhere to Bushido themselves (many of the lower castes do not). Rank 0: An honorless dog. You do not adhere to Bushido and mock those who do. You cannot be trusted, for you'll betray anyone for advantage. Most criminals have this Rank. Rank 1: A poor son or daughter. While you are hardly honorable, you are somewhat reliable. Some veneer of virtue remains, a loose morality even you won't violate. While you might not bring honor to your family, you act honorably when the threat of punishment is real. Bushido is imperfect and inconvenient, but not a bad ideal. Rank 2: You can be counted on do what is expected. You follow the tenets of Bushido to the letter, but still have qualms when it supplants your own desires. You uphold it, but sometimes it is still hard to understand. Still, you are generally honorable, and those who act selflessly are heroes in your eyes. This is the default Rank for most samurai. Rank 3: Your adherence is considered exceptional. You have seen the strength of Bushido, and while you feel the temptations of “low” character, you resist with some effort. Occasionally you allow yourself to ignore virtue for practicality, but such decisions haunt you. Rank 4: You are above question, a rarity in your devotion to Bushido. Little turns you away from your duty. Others frequently admire you, but often view you as impractical and rigid. For you, Virtue is its own reward. Rank 5+: The paragon of honor and the stuff of legends. Those who dare to question your honor only call their own into doubt. You are selfless in devotion to Hachigoku, uji, family, and friends. In that order. You never turn down a challenge, never run, and never forgive the dishonor of others. You might not be much fun, either. Glory is a measure of your fame, mostly from personal accomplishment. It is subjective and can vary wildly depending on a character’s location and deeds. A renowned duelist, for instance would have a greater amount of Glory than a minor clerk in the Imperial library, even though such a position would be one of high honor. High Glory does not impose obedience from others, but it does command respect. Glory can be a burden, though, as they will often find themselves recognized when they don't want to be. While Glory is independent of status, it can lead to higher status; Hachigoku loves its heroes. Glory Ranks: Like Virtue, Glory is measured in Ranks, and your Glory cannot go below Rank 0 (a complete unknown, or someone not worth respecting), nor can it exceed your highest Element + highest Discipline. Your Glory must not only be earned, but deserved. Since your Elements represent a unity of physical, mental, and spiritual qualities divided into defined aspects, others instinctively assume that your worth (Glory) cannot exceed your general level of capability, despite “spikes” in your magnificence. Rank 0: A complete unknown, and probably not worth knowing. Samurai ignore you on the street, and send your letters to the trash. Rank 1: A samurai worth commanding. You haven't made a name for yourself, but you haven't shamed your family either. Rank 2: You've been given a small but respectable amount of authority. Local villagers know and respect you. Rank 3: You've become a minor hero to your family and uji for some notable deed. You can expect local subjects of your daimyo to aid you, as long as it's convenient. Rank 4: Some whisper your name in the courts of Hachigoku beyond your own. Storytellers in the street mention you in tales. Actors mock you on stage. Rank 5+: They praise and curse your name in court, shout your name in the street, and aspire to your heroism on stage. Virtue is fluid; it rises and falls according to your actions, being the demonstration of your understanding and adherence to Bushido. Incorporating the consequences of your actions into your soul takes some time. After all, a single instance of virtue does not actually make one virtuous; you must know you are being virtuous and consistently embrace your virtue. Only experience of habit can accomplish such a task. Spend a Season Action and 10 Honor to increase your Virtue by 1. Your Virtue may not be advanced more than 1 Rank per Season this way, and unlike most Season Actions the effect takes place immediately. Normally your Virtue and Glory are fixed at character creation, with some modifications from Fortunes. However, you may succeed in benefiting (or even suffering) from situations. An uji samurai's Glory is 1 already because of the first Discipline Okuden they learned; they get no further benefit. A Ronin Okuden, on the other hand, confers no Glory benefit, even though a few specific ones may; these are bonuses in addition to the normal starting Glory 0 of ronin. If you receive a promotion from a Fortune, it's benefit is factored in (it usually gives you a bonus to your Glory). If you manage to raise a Skill to 7 (gaining Mastery), you also gain any benefits or penalties to the associated Virtue or Glory. Assume any other narrative effect you put in your back-story to have been mediated over time. Glory is even more fluid, and somewhat more capricious. It rises and fall not only according to your actions, but by their recognition. Who sees you commit honorable or glorious acts is important, even though Glory functions much like Virtue. The simplest way to raise it is spending a Season Action and 10 Honor. Doing so raises your Glory by 1 immediately; stories of your achievements have circulated throughout Hachigoku all through last Season, and your harvest comes early. Like with Virtue, this is one of the few Season Actions with immediate benefits, and it cannot be raised more than once per Season in this manner. Recognition of your merits is important; there is nothing glorious about actions unseen, even if there remains virtue. All Glory gains and losses are negated if no one of your caste or higher witness them, unless they are informed later and publicly acknowledge your deeds. Whenever the witnessing occurs, gains and losses are handed out at the end of the Scene. Of course, there may be those who do not want their accomplishments and life to be known facts trumpeted throughout Hachigoku. This includes both those who believe that fame corrupts, and those who prefer their lives anonymous because renown would impair their ability to function, hampering their use to their daimyo or just themselves. Glory can become dangerous to both the body and soul. If you wish to hide your worth, make sure to perform actions that affect your Glory away from witnesses. At least those who can affect it. If a heimin witnesses a samurai perform some action, either noble or shameful, not enough of those in the samurai caste will heed the story for it to affect your Glory. However, a daimyo's spies might hear the story, and pass it on to be used at the right moment. Usually the wrong moment for you. If others of your caste know, and you want no Glory, it depends on who it is. If they are of your wa, they can choose to keep it secret. If they are not of your wa or superior in status, such stories have a way of circulating regardless of your wishes. If the story is known only to someone of authority (whether in your faction or not), it is their decision whether to promote or ignore your actions publicly. Likely they will do whatever suits their purpose, hiding the acts of their spies and assassins (ad publicizing those of their enemies) while bragging about their generals and duelists (or ignoring the accomplishments of their enemies). Of course, they may simply view Glory as an impediment to purity in some fashion. Another way to avoid Glory gains is to allow another to take credit for the action; they gain Glory as if they had performed the action. It must be possible for them to have performed the action, however, so you can't transfer credit for an event everyone knows they weren't involved in, or for things like increasing Discipline or Skills. You can even try to steal credit for another Glory gain with the Sincerity Skill, with the same conditions (and as an Act of Vice). Bugei Mastery: Great skill in bugei, the “warrior arts,” is considered highly glorious. Whenever you gain Mastery in a Bugei Skill (unless you are trying to hide your training), you gain 1 Glory. Jutsugaku Mastery: Great skill in jutsugaku, the “practical learning” of the courts, is highly virtuous. Whenever you gain Mastery in a Jutsugaku, you gain 1 Virtue. Discipline Okuden: Whenever you increase the highest level Discipline Okuden you know, you gain 1 Glory. This is only if the new Okuden is your highest; if you already have first two Ranks of a Basic Okuden, and then learn the first Okuden of either a Basic or Advanced Discipline, your Glory gains no benefit. Neither Branch Disciplines nor Ronin Okuden affect your Glory in this way. It is up to your superior whether this is publicized or not. Arts: The soul that beholds beauty becomes beautiful. Creating a work of art, be it a performance or an object, can be highly honorable. This is only possible for souls of a certain Virtue, however, as those less attuned cannot grasp the excellency of the artwork. Thus, you cannot gain Virtue for the arts if you have a Virtue below 3. “Arts” are considered any use of Artisan, Oratory, or Performance Skills, in addition to the Craft Aspects of Swordsmith and Armorsmith. Under the right conditions, even the Games Skill (perhaps with a masterful game of Go between two sensei) could be exquisitely executed, or a Bugei Skill could be performed as a demonstration of its katas and forms. You may produce such art by spending a Season Action, and then making a simple roll with Legendary Difficulty (art makes no guarantees). Those who produce the art receive 1 Virtue, and can make Raises to increase the gain by +1 Virtue per Raise. Those who witness a performance gain half the number of Virtue (min. 1, round down). Those who absorb a created work (studying it at some length) for the first time also gain half the Virtue, but this bonus fades by 1 Virtue per Season. You can also make sure the art is beheld publicly to increase your Glory. The product is worth Glory equal to the Virtue gained; this is a single award, and it must have a wide circulation. A private performance for only a couple of guests or a work that is given as a gift to another does not qualify. Duels: Accepting duels is always honorable, even if it is foolhardy against a clearly superior opponent. Or even against an inferior opponent (doing this may incur a loss greater than the reward, however). Duels need not be iaijutsu duels, although those are by far the most praised. They need not even be strictly affairs of combat—teishin and onmyoji throughout history have developed several alternative methods of competition: Winter Court games, riddle challenges, etc. If you are challenged to a duel and win, you gain 1 Virtue. If you are the challenger and win, you gain 1 Glory. If the duel involves a type not normally practiced by your Dharma and you win (such as an omyoji winning an iaijutsu duel), any such gains are doubled. Battles: Samurai are often referred to as “those who make war.” Engaging in warfare through battles is often considered by many to be the only “true” way to gain Virtue and Glory, depending on who you fought against. If you are in the winning force against a force whose majority is samurai, you gain 1 Glory, even if you died. If you also survive, you gain an additional Glory. If you are the force's commander, you gain an additional Glory. If the Battle is against a force whose majority is made up of known criminals or those outside the “Celestial Order” (ninja, gaijin, monsters, etc. ), all Glory gains are instead Virtue gains. These gains also apply in a Vendetta if it is publicly sanctioned. Paradoxically, the more Virtue you gain, the easier it is to lose; a samurai at the height of Bushido has a longer and more tragic fall than an honorless dog. The effects of the fall are swift, however. Acts of Shame egregiously violate Bushido, discouraging others from embracing the nobility of the warrior code. They put the actor at considerably more peril in a way that is difficult to redeem. These extremes of dishonor are rarely private, or require enormous effort to hide. Most who fall so far so fast rarely see any point in making the long climb back to the even a plateau of acceptable integrity, and simply admit defeat. Acts of Shame are much more static, grounded, and prone to display. The Virtue lost by such Acts are not affected by your current Ranks, but may destroy your Ranks entirely in one fell swoop. The fall from Glory is a sharp descent compared to the long climb up. Word of your misdeeds also travels faster than stories of your former heroism. While Glory losses are more severe than Glory gains, however, your prestige does offer some protection; it's hard to believe that a great hero would engage in villainy. All attempts to persuade others you have committed dishonorable deeds (whether true or not) causing a Glory loss suffer a difficulty penalty in Steps equal to your Glory. The most common loss of Virtue and Glory involves a loss of too much Honor. If you lose more Honor (due to Acts of Vice or any other source) than you actually have, you must choose to lower either your Virtue or Glory by 1. You cannot choose to lower one of these if they are at 0; if both are at 0, then then there is no further effect. Your Honor is then reset to 0. Hinin Mastery: Great hinin skill, the activities of the lowest caste, is highly dishonorable. Whenever you gain Mastery in a Hinin Skill, you lose 1 Virtue. If this is publicly known among samurai, you also lose 1 Glory. Demotion: If you lose an appointed position or drop in military rank by order of your superior, you lose 1 Glory. If the demotion is accompanied by a public reprimand, you lose 2 Glory instead. Duels: A true duel is not only a test of skill, but puts your honor on the line. If you challenge a foe clearly beneath your ability (at the SD's discretion), you lose 1 Virtue. If the challenge is public, you also lose 1 Glory. If you lose that duel you lose an additional 1 Virtue (and 1 Glory, if necessary). If you decline a duel you lose 1 Virtue, and 1 Glory if the challenge was publicly made; you do not suffer this penalty if the foe is clearly beneath your ability. Any unfair tactics in a duel (depending on the duel's nature, of course) erases all of your Virtue to 0; if the cheating is revealed publicly, your Glory turns to Infamy. Engaging in a duel and losing fairly is never considered dishonorable. Battles: While losing in war is not inherently dishonorable, it is certainly possibly to lose in a dishonorable fashion. If you are in a losing force against a force whose majority is made up of known criminals or those outside the “Celestial Order” (ninja, gaijin, monsters, etc. ), you lose 1 Virtue and 1 Glory. If you are the commander of the losing force, you lose an additional Virtue and Glory. If you flee from a Battle you lose 1 Virtue; if your retreat, however orderly, is witnessed, you also lose 1 Glory. It doesn't matter if you are ordered to disengage or fearfully run. These losses also apply in a Vendetta if it is publicly sanctioned. Fading Glory: Glory fades over time if you do nothing to maintain your reputation. At the end of every Season, you lose 1 Glory. However, this does not lower your Glory below your lowest Element. You can negate this loss by spending Honor equal to your current Glory. Dark Whispers: If anyone you are connected closely with, such as a blood relative, sensei, wa member, or daimyo commits an act that costs them Glory or gains them Infamy, you lose 1 Glory. Murder: Slaying your enemy is honorable, but only in warfare, a duel, self-defense, or with the permission of your superior. Causing the death of another, especially via dishonorable means such as poison, without lawful sanction is murder. This is a violation of the Celestial Order, one of the most heinous. If you mistakenly cause the death of another of your status or higher without sanction, you lose 1 Virtue. If you willingly cause the death of another of your status or higher without sanction, you are reduced to 0 Virtue; if this murder is publicly known, your Glory turns to Infamy. Note this only applies to those of your station or higher; a samurai is within his rights to slay any heimin or hinin for offending him. However that person may be under another's authority, provoking a response to the insult. And, of course, being an Act of Vice against compassion. Blasphemy: You turn your back on a tenet of Bushido, or even the entire concept. You betray a thousand years of tradition and honor. If you voluntarily disregard one of the virtues of Bushido, considering it a weakness rather than strength, you lose 1 Virtue, and your maximum Virtue is reduced by 1. If this makes your maximum Virtue 0, you lose Virtue entirely. You can't even claim to be an honorless dog, and your Glory turns to Infamy if this repudiation of Buhido is publicly known. For each such virtue discarded, you no longer lose or gain Honor connected to it as an Act of Virtue or Vice. Discarding a principle of Bushido is no light matter; it requires long and intense soul-searching. In other words, you must spend a Season Action to discard a tenet, and it is neutralized at the end of the Season. Ronin/Exile: If your uji exiles you from lands they control, you lose 2 Glory. If you are made ronin, either by decree or ill fortune, or exiled by Imperial decree from Hachigoku entirely, your Glory is reduced to 0. You'll have to start rebuilding your Glory from the ground up. Impurity: Being clean is of great importance to samurai. By touching things that do not fit their definition of “clean” they anger the ancestors that guide and watch over them. To a samurai’s mind, this act also defiles his soul and violates tenets set down by the Fortunes. Sweat and blood are considered unclean, and it is taboo to touch the flesh of another if either is upon them. Even a kimono and pommel of a katana must be made or wrapped in silk to keep sweat from soaking into the material. 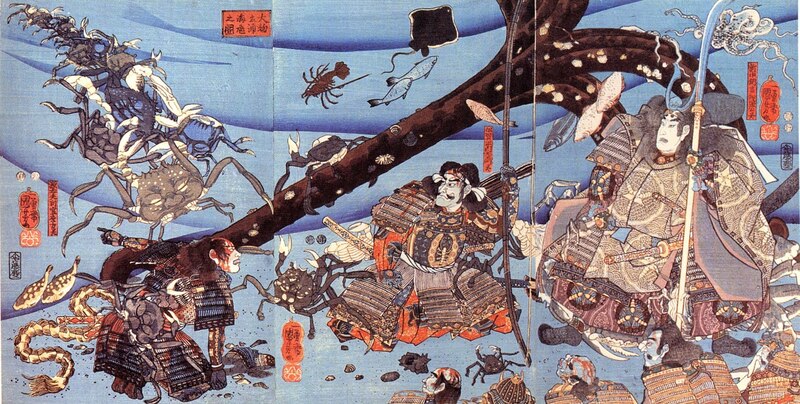 Fish, rabbit, and bird are largely considered the only meats that samurai can consume without dishonoring themselves. Certain uji may be more lax about these customs. Samurai rarely touch each other as it is, and a samurai’s hands usually fall upon the skin of another during sports, combat, athletic activity, or intimate activity. When it is necessary to touch someone, it is either upon the hands or the clothes alone. Those who have touched dead flesh are unclean until the proper rituals are done; dying in such a state is sure to guarantee rebirth as hinin. Hinin are normally required to move dead bodies, and samurai are wise to let them do their job. However, being covered in the blood (or worse) of your enemies is honorable immediately after the fact; refusing to clean yourself is not. If a samurai touches dead flesh intentionally, he is reduced to Virtue 0 immediately. If this is observed publicly, Glory turns to Infamy. This may be mitigated by certain factors, such as Skill uses by certain samurai who are exempt from Virtue losses while using the Skill. Also, if it is required to otherwise act honorably, the samurai loses only 1 Virtue, but gains no benefit (in terms of Virtue, Glory, or Honor) he would normally gain for the activity. You might have gone too far. You might not have gone far enough. Whatever you did, the road back to Glory is blocked with formidable obstacles. Hachigoku no longer judges you as moving towards or away from an honorable life; it judges you incapable of such a life. Now you are to be feared and reviled, even though your position or the extent of your villainy is phenomenal. They may still be forced to deal with you because of your status or their oaths, or even forced to contend with your legend. Acts that lose you Glory cause a loss of recognition and force of reputation as Hachigoku pulls away from you, hoping to shame you back into honorable ways by withdrawing respect. Some acts, though, are too dark, too disgusting to be brushed away or suffer mere disapproval. These crimes against the Celestial Order instead result in transforming your Glory into Infamy. Your misdeeds have gained you fame of the worst kind. You are a force to be reckoned with. People will never respect you, but they will fear you. Not only for what you have done and can do, but for the spiritual disturbance your existence confronts within the Celestial Order. You might be fine with that. When your Glory becomes Infamy, you immediately lose all Honor (it is reset to 0), and your Glory is replaced with identical Ranks of Infamy. Some events may immediately turn your Glory to Infamy (cheating in a duel, blasphemy, murder, impurity). Being made ronin or being exiled does not necessarily make one instantly Infamous. However, it does have an impact on your Glory and Infamy. If you already have Infamy, changes in fortune (the reduction of Glory, see above) do no nothing to your Infamy, and if they are coupled with a change to Infamy (an Imperial decree reveals your Infamous act as reason of exile, for instance) only result in a change to Infamy equal to your former Glory, and the loss of Honor. If you refuse to recognize being ronin or exiled, or violate exile without the appropriate permission, your Glory (even if you have 0 Ranks) becomes Infamy. Duels: Challenges never gain you Infamy, but victories still do. Duels against those inferior to you do not lose you Infamy but instead give you more. Gifts: No one praises gifts from the Infamous. No Honor. Arts: No one is inspired by the works of the Infamous (or at least, no one will admit to be). Your art cannot give others Virtue. Bugei & Hinin Mastery: A greatly skilled villain is a villain to be feared. You now gain Infamy for mastering both Bugei and Hinin Skills as if gaining Glory. Murder, Ronin/Exile, Impurity, and Dark Whispers: These have no further effect on your Infamy. Quest: If a superior sets you upon a quest of danger and sacrifice to cleanse you and give your faction great Glory, you may redeem your Infamy. To do so, you must gain gain enough Honor from completing the quest equal or greater than your Infamy, minus the Glory of the superior who assigned the quest. Once accomplished and acknowledged, you lose Infamy replace it with the same amount of Glory, or with Glory equal to the superior's (whichever is lower). Your Honor is reset to 0. You gain 1 Virtue. Restoring the Celestial Order: If you can claim victory over any enemy to the Empire outside the Celestial Order (as defined earlier) whose Threat, highest Element, or Infamy exceeds your Infamy, and it's acknowledged by a superior, you are redeemed. You lose your Infamy and replace it with equal Glory. Your Honor Points are still reset to 0. You gain 1 Virtue. Supreme Virtue: If you commit an Act of Virtue with supreme sacrifice (usually your own death), and a superior acknowledges it, you lose Infamy and replace it with an equal amount of Glory. Your Honor is reset to 0. You gain 1 Virtue. This is often posthumous. Honor is stronger than steel. This is a mantra every samurai utters during training as a youth. It doesn't matter if you spend long hours repeating katana strikes, mastering prayers to the kami, or memorizing poetry and rhetoric for days on end. Honor is stronger than steel. This is how it cuts. If Virtue is your inner worth, and Glory your external, then Honor is the application of these measures upon the rest of the world. With Virtue you may resist temptation and interference; with Glory you may impose your will. Virtue and Glory are both fluid; Honor is more like quicksilver. It is won and lost and spent continuously throughout a Story. Honor is not meant to be hoarded, but used. Virtue Enhancement: You may spend an Honor when making any active defense (whether in combat, as a social roll, or in any other situation) to add your Virtue in unkept dice to the roll. This assumes you are not the initiator of the active TN roll. Glory Enhancement: You may spend an Honor when making any active TN roll against another (be it in combat, as a social roll, or any other situation) to add your Glory in unkept dice to the roll. This assumes you are the initiator of the roll. Simple Success: When making any simple TN roll, you may spend an Honor, plus Honor equal to any difficulty steps involved, to automatically succeed. You receive no benefits from Raises, except Free Raises. Kaonashi Promotion: You may spend an Honor to promote a Kaonashi character to Namae status. See the “Ten Thousand Things” section of Chapter 3 for more information. Increase Virtue & Glory: Already mentioned, you may spend 10 Honor and a Season Action to increase either your Virtue or Glory by 1. Gaining Honor: There are various ways of gaining Honor, which fall into three broad categories: starting a new Story, performing Acts of Virtue, and achieving success. At the beginning of each new Story your Honor is refueled: you gain Honor equal to your Virtue plus Glory. A new character assumes this as a default; you don't get the award twice. As your Virtue and Glory change, so does the Honor you receive from this refueling. Honor gained through Acts of Virtue flow more dynamically. It is easier for a lower Virtue character to acquire Honor than it is for higher Virtue characters. Climbing to the highest reaches of your soul is easier at first, because the demands on your soul become greater once you yourself are more honorable. Rising in honor should be more difficult the farther you travel the path of Bushido, precisely because what was exceptional for an honorless dog is routine for a samurai with the strength of a thousand ancestors. But then, the benefits of actually being honorable rise as well. Such Honor gains are awarded at the end of a Scene. Any time you perform a task in accordance with one of the tenets of Bushido, you may gain Honor. However, these cannot simply be the execution of your obligations to anyone but yourself, and can be for no other gain than the correctness of the action itself. Thus, this does not concern Actions as a single die roll or momentary impulse. Honor awards for Acts of Virtue should occur at the end of a Scene, or even an entire Story so that their dimensions are adequately considered. Not that every deliberation, purpose, or effect possible is accounted for, but just so reasonable expectations are covered. Honor awards are for actions that are honorable but not required, or even harmful to you. Risk awards Honor. Duty requires Honor. There's a difference. Compassion (Jin): Aiding a wounded enemy. Kindness to those beneath your status. Courage (Yu): Facing a clearly superior foe in the name of your uji, family, or someone or something else you have sworn to defend. Overcoming any attempt to coerce you into an action against your will, including magic. Courtesy (Rei): Enduring an insult to yourself. Politely ignoring another's dishonorable behavior. Sincere courtesy to your rivals (could also display Makoto). Duty (Chugo): Acknowledging responsibility for a superior's shameful action (could also display Makoto). Following orders despite personal misgivings. Protecting or furthering your uji or family's interest. Justice (Gi): Acknowledging a superior opponent (this shows not only honesty in appraising another's skill, but your own). Giving a truthful report (this is usually required, but could likely be dangerous if it could damage or offend your daimyo; could also display Makoto). Forcing a criminal to face the judgment of law, your daimyo's or the Empire's. Restraint (Jisei): You resist a temptation that runs counter to your duty. You refuse to cry out in physical or emotional pain, or retaliate for your suffering. Although the suffering of another causes you to suffer, you do not let them witness your outburst. Sincerity (Makoto): Fulfilling a promise (could also display Chugo). Convincing another of your sincerity or belief (this cannot be an outright lie). 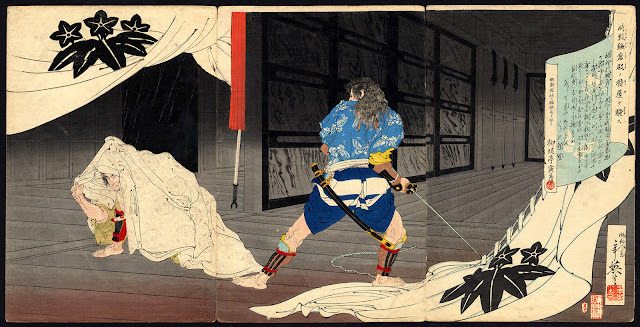 Raise Conversion: The most common way of generating Honor is exceptional success; when succeeding on a roll using a raw Element or an honorable Skill (one that is from the Jutsugaku or Bugei Skill Groups; others may qualify depending on Aspects or other special abilities), you may convert 2 Raises (even Free Raises) into a single Honor. Duels: Issuing a challenge always gains you 1 Honor. Winning any duel gains you Honor equal to the Glory of your foe. This in addition to any effects upon your Virtue and Glory. Battles: Every time you are targeted with a Battle Action, you gain 1 Honor. Unless it is to Flee. Vengeance: Avenging insults and demanding blood for blood is an honorable enterprise in Hachigoku, and highly ritualized. If engaged in a Blood Feud (where entire family lines swear vengeance against another), you gain honor for slaying your enemies. After slaying members of the opposing families, you gain Honor equal to the highest Dharma or Threat among the slain enemies you engaged, minus your Virtue. Vengeance is honorable, but the unrestricted lust for blood begins to trouble the purest souls. It's important to note this involves families, and sometimes individuals. A Blood Feud cannot be granted against an entire uji. Restoring the Celestial Order: This a polite way of saying “destroy those different!” Any time you defeat groups of purely Yin or Yang creatures, ninja, gaijin—pretty much anyone considered to be separate or violently opposed to the Celestial Order by their very existence, you gain Honor equal to the highest Element or Threat among the slain. Note the “by their very existence” part; lower castes in rebellion do not count outside the Celestial Order, or violently opposed to it by their very existence. And, of course as everyone knows, ninja do not exist. Quests: Accepting a quest from a superior (be it your daimyo, an elder relative, an Imperial official, a Fortune, etc.) and accomplishing it is worth Honor, granted at the end of the concluding Story. This quest must involve significant danger to yourself, and fulfilling the quest's objective is worth Honor equal to the Stories it took to complete, plus your Glory. Losing Honor: Paradoxically, the more Honor you gain, the easier it is to lose; a samurai at the height of Bushido has a longer and more tragic fall than an honorless dog. The effects of the fall are swift, however. Like Honor gains, Honor losses take effect at the end of a Scene. Gains and losses cancel each other, applying the remainder. If the loss is greater than your current Honor, lose all Honor and either a Virtue or Glory Rank. Like Honor gains, losing Honor falls broadly into two categories: Acts of Vice, and particularly shameful actions. Dishonesty: Accepting a bribe. Outright lying (without using a Skill). Cowardice: Fleeing from battle (rather than sensibly retreating). Not resisting orders you know are disastrous to whoever you owe loyalty to. Cruelty: Instigating unwarranted violence. Subjecting others to injustice. Disrespect: Being duped into a dishonorable activity. Breach of etiquette (improper introduction, spilling tea, public drunkenness, insulting a host, gluttony, sloth, etc.). Insincerity: Manipulating another into a dishonorable activity. Breaking your promise. Disloyalty: Disobeying your superior's commands. Accomplice to a crime. Indulgence: Giving in to temptation. Acting or allowing another to act recklessly. Like static losses to Virtue or Glory, there are certain fixed penalties to some exceptionally dishonorable acts. They put the actor at considerably more peril in a way that is difficult to redeem. These extremes of dishonor are rarely private, or require enormous effort to hide. Most who fall so far so fast rarely see any point in making the long climb back to the even a plateau of acceptable integrity, and simply admit defeat. Hinin Skills: Hinin Skills are a blight on the soul. Whenever a samurai successfully uses a Hinin Skill they lose 1 Honor. Oddly, failing a Hinin Skill roll, and thus being a failure at dishonor, does not stain your Honor further. Impurity: For the specifics of being “impure,” see the Virtue section. Entering any religious site (such as an ashram, seido, or shinden) requires at least some nominal purification, such as washing the hands or mouth with water. Failure to do so costs you 1 Honor. War itself is considered very honorable, so blood and sweat that covers a samurai during battle is not dishonorable. Afterwards, though, a samurai is expected to undergo cleansing rituals, both to clean their body and wash the death from their soul. Having a descendant skilled in war is no dishonor to the ancestors, but having one who carries the stench of death with him is. Entering a new Scene without having cleaned off the detritus of war costs you 1 Honor. Unlike your character, NPC's do not gain and lose Honor as normal. Instead, they access a combined Honor Pool, administered by the SD. At the start of every session, the Pool is empty. Whenever you spend or lose Honor, for any reason, the SD adds the same amount of Honor to this Pool. An NPC can still use Skills or any other abilities to gain Honor, but even these Points are not entirely their own and go into the Pool. Neither Acts of Virtue nor Acts of Vice, however, affect the Pool; their significance is swallowed by the combined kharma of Ten Thousand Things. Any NPC at any time (subject to normal limitations) can spend the Honor for their normal effects. Once spent, such Honor vanishes, and the Pool empties at the end of every session. Any act that affects their Virtue or Glory directly, however, affects them individually.